This nephew wanted to be a Jalapeno pepper, but he kept saying he wanted it in red. 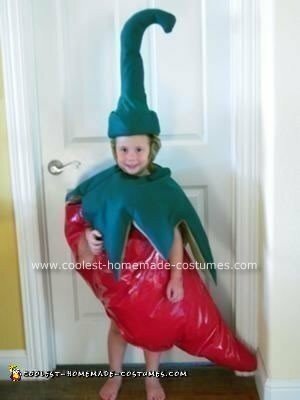 I finally figured out he wanted a Homemade Chili Pepper Halloween Costume, like the ones he sees at the restaurant he loves. I brazenly stole the image of the chili pepper from aforementioned restaurant’s web site. God forgive me. I then pulled out an old rusty protractor to figure out the curve of the inside and outside of the pepper. I measured as many features as I could on the pepper, such as stem length and width, leaf length, total length, etc. Using the child’s height, I came up with a total length for the costume. The length of the image is a proportion of the length of the costume. Once you have that fraction, you can solve for “x” to get all the other measurements for the separate features. Measure it out on newspaper and you have the pattern. The body of the pepper was cut from shiny red pleather and sewn to make a cylinder. I lined it with gauzy material and left the top open to stuff with fiberfill. I didn’t know where to put the arm and leg holes, so I had to hold it against him to see where it would look best. The leaves and stem, made of fiber filled green felt, were originally all one piece, which looks great on the floor, but flops terribly when worn as a hat. I disconnected the stem and made a slit on top of the leaves so it could be worn on the shoulders. I found an old hat which fit his sweet head, cut a hole in the top and fit a sturdy plastic cup in it. I fitted the fiber filled curved stem onto the cup, then hot glued strips of the same green felt to cover the rest of the hat. It’s held on, tenuously, with cloth covered elastic with Velcro at the ends. We figure he should get some free fries from the restaurant OR I get arrested for copyright infringement.